Philip Larkin is, in the estimation of The New York Times, the archetypical English poet of the second half of the 20th century., As such, the occasion of the publication of his collected works earlier this year merited a cover review in The New York Times Review of Books. To get a cover illustration that matched the merit of the man, the Times resorted to an increasingly popular solution: have a group of students at Parsons The New School for Design create it. 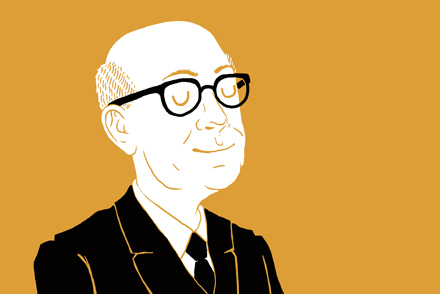 Students in the Illustration program at Parsons crafted a range of distinct looks for Larkin for the Times, with a piece by senior Iain Burke selected for the cover image. A full gallery of the 10 illustrations created for the project are available to view here. The project was led by acclaimed illustrator Lauren Redniss, an assistant professor of Illustration, who was recently named a Guggenheim Fellow for exceptional creative ability in the arts., Redniss is also a National Book Award Finalist (for her illustrated biography of Marie and Pierre Curie, Radioactive), and Pulitzer Prize nominee (for her work with The New York Times). This project was the second illustration collaboration between the Times and Parsons in under a month; in March, a group of students at Parsons created new posters for the classic Arthur Miller play Death of a Salesman on the occasion of its much-lauded Broadway revival. Six standout posters were selected for publication on the Times website.